Hi crafters here is my tutorial on the latest card i created for Heartfelt Creations! Now take your Eyelet Oval using the scalloped edge with the Under the Sea paper in pink. 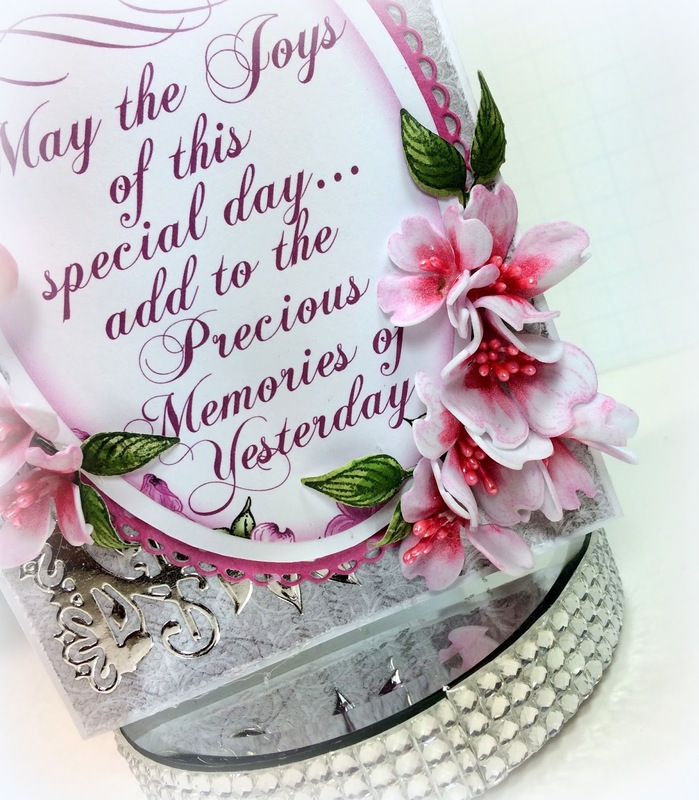 Now use the oval to diecut the sentiment from the Heartfelt Love collection which you will lay over the scalloped cut. This will be the card focal point. Instructions: Take your white cardstock and create a 4.25 x 6.25″ card base. Next cut your Classic Wedding paper and cut to 4×6″ this will be your background paper to your card. Then take your distressing tool and distress the paper edges. You will then tear a small slit at the top and curl the edges outward. This is where you will lay the bling button. Next diecut using the Sweetheart Borders die and silver foil paper. Once done adhere this to the card front along the side using dries clear adhesive. Place the straight edge of the die along the edge. 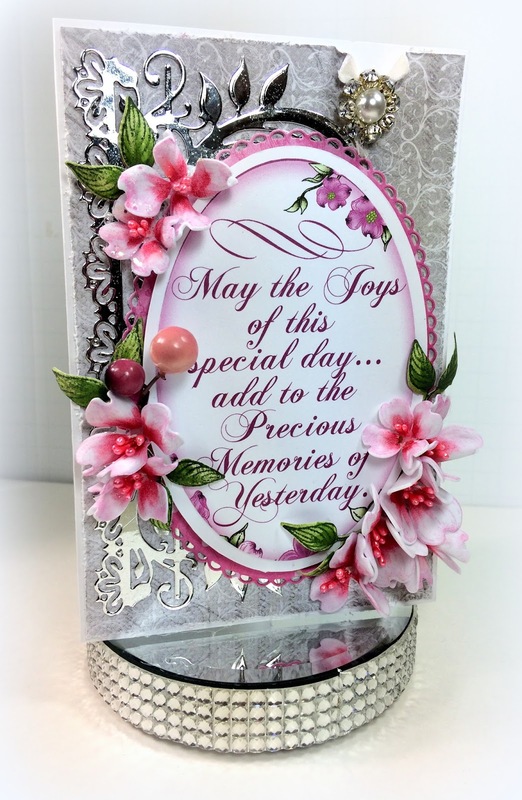 To create your Flowering Dogwood flowers simply stamp medium size flowers from the stamp set using the Memento Dye in Rosebud on the Art Foam a total of 4 times. Once done diecut the stamped flowers and add some color and shading using your Copic Sketch pens in RV11 and RV55. Now taking your tweezers lay each flower against your iron until you see the foam begin to sort of melt. When this happens this is when your Art Foam is in the molding stage. Take each flower and fold and roll between your fingers. Once your are done take your piercing tool and pierce the centers to add your stamens. Diecut a total of 5 leaves from the Flowering Dogwood set onto the Blazing Poppy patterned paper using the Memento Luxe ink in Northern Pine. Then add some color and shading with your Copic Sketch: YG17 and G94. 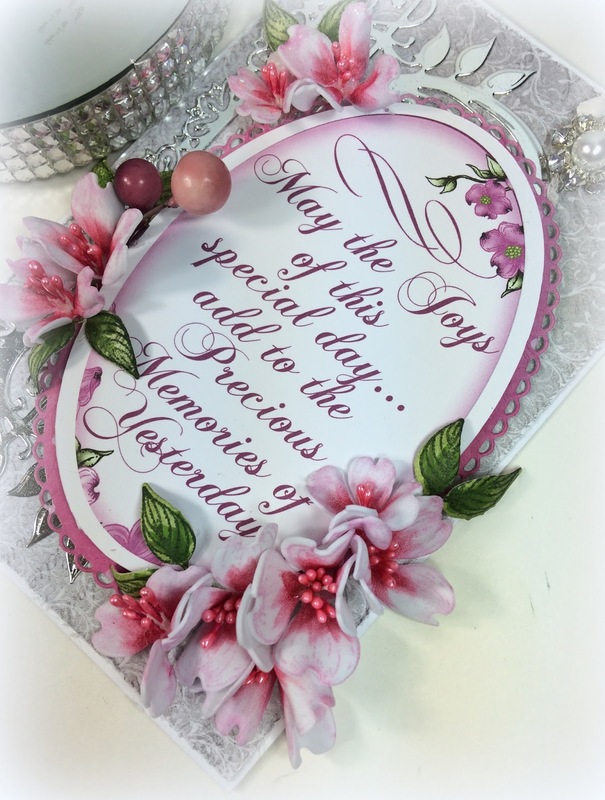 Once all your flowers are complete simply arrange them as desired onto your card surrounding your sentiment. Add your leaves and bead spray for added decor.